Happy Thanksgiving! Decided to write a quick(?) post before starting to peel potatoes. When I started working at the film archive in 2003, one of the first filmmakers whose work I wanted to do something to preserve/restore was Will Hindle. Will died in 1987. In the 1960s and 1970s, he was easily one of the more influential and acclaimed experimental filmmakers working. Even his earliest films, like Pastorale d’ete (1958) and Non Catholicam (1957-63/64) had a huge influence on people like Bruce Baillie (who helped Will shoot Non Catholicam). 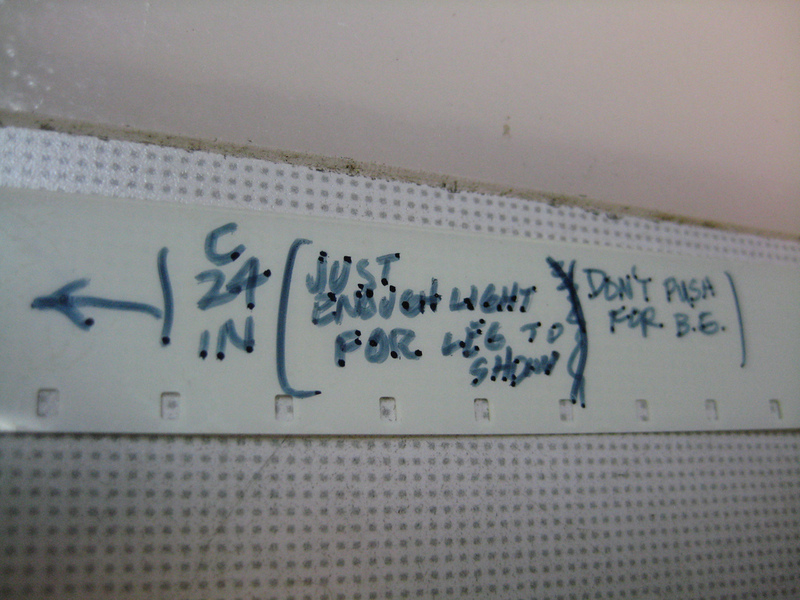 Stan Brakhage was a great friend and admirer. By all accounts, Will was a deeply intelligent, sensitive, and intense person and artist, who affected many he encountered over a few decades of existence on the independent film scene. Several of his 1970s/80s students I’ve spoken to have a profound connection to him, and count him as a chief influence in their lives. A much more extensive post should be written on Will, but I’ll try to address that in the future. One important thing to mention is that Will’s films wouldn’t have survived if it weren’t for the incredible Shellie Fleming, who has not only been an exceptionally influential professor for many SAIC students over the years, but was also the person who really single-handedly saved and cared for what survived of Will’s films for many years until she and I got in touch in 2003 to talk about preserving them. She has been an important inspiration to me as well. 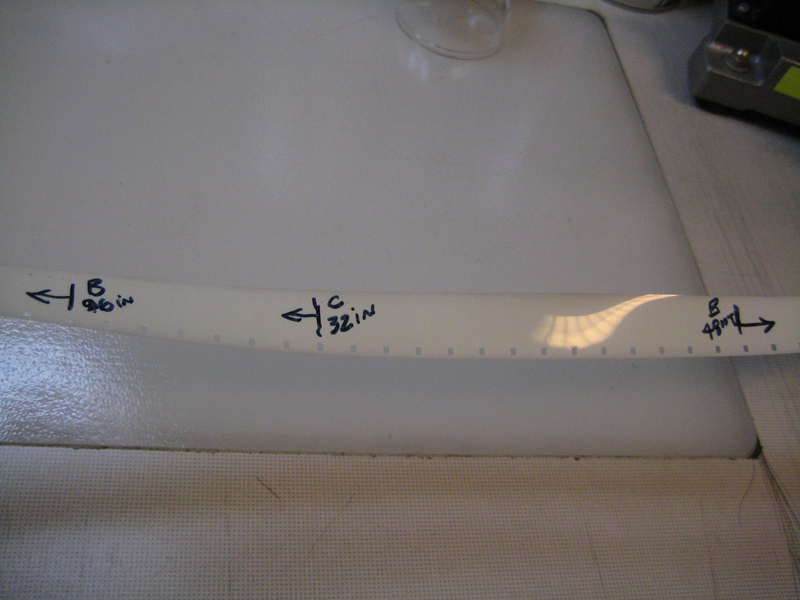 There are a lot of pictures for today’s post, all of a single object. One of Will’s most complex films in terms of its visual choreography and editing, is Watersmith (1969). 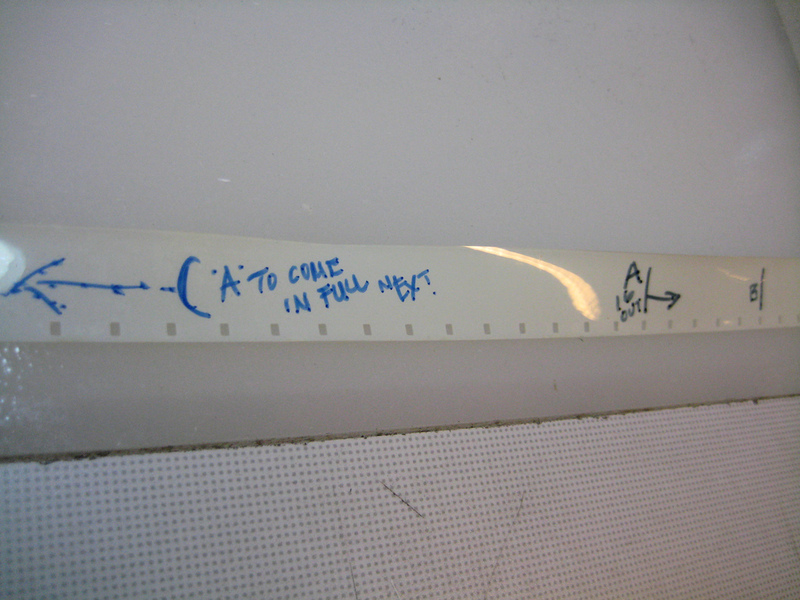 Will clearly had an incredibly deep and seemingly innate understanding of the possibilities of film printing. 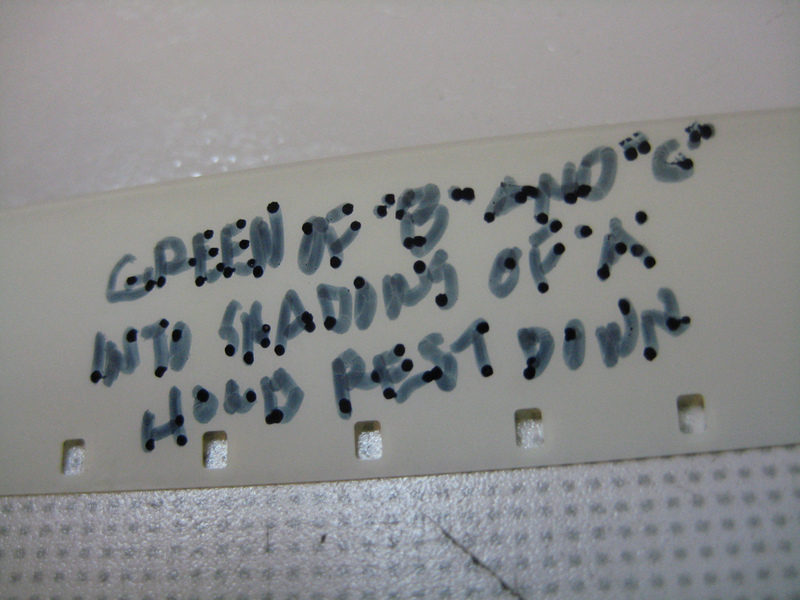 His editing and composition reflects this, and his most accomplished films, like Billabong (1968), Chinese Firedrill (1968), and Watersmith reflect a truly uncanny understanding of the remote capabilities of a film printer and the seemingly inconceivably rich ways in which that process could be manipulated and exploited. 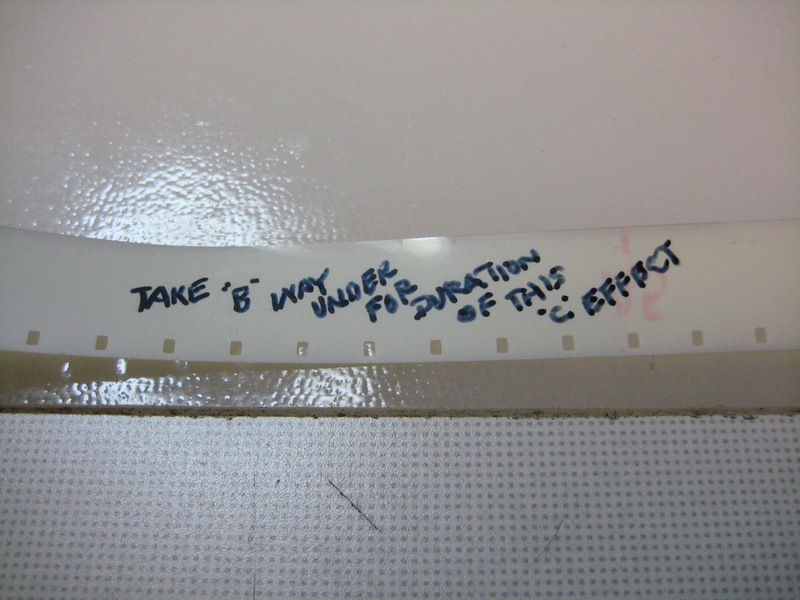 In working with Will’s surviving film materials, one method I’ve realized that he employed to visualize this process is that of the visual cue roll. Although I can imagine that other filmmakers must have used similar methods (perhaps Scott Bartlett or Tom DeWitt? 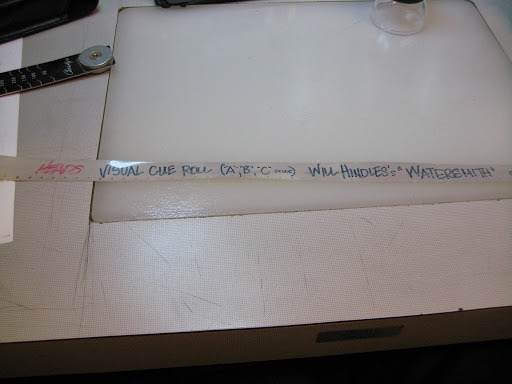 ), Will’s visual cue rolls are the only ones I’ve personally encountered. 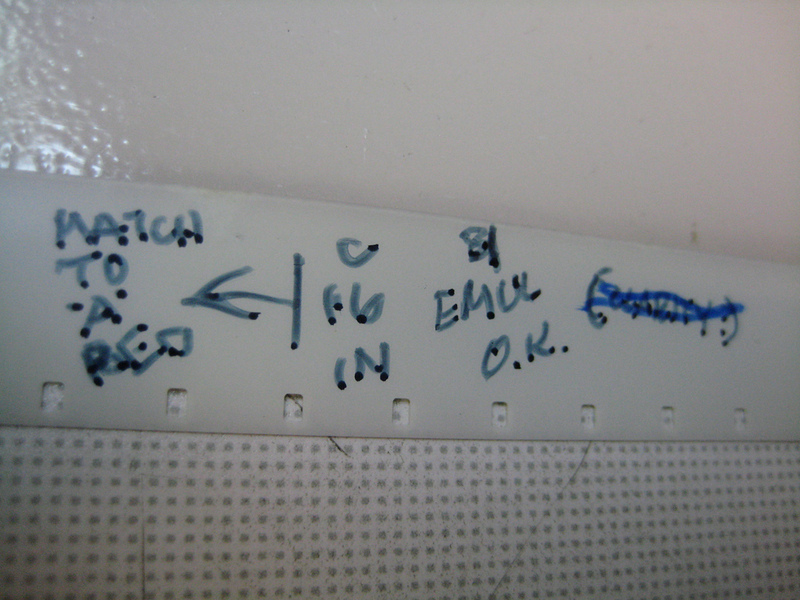 At the archive, visual cue rolls for Billabong, Chinese Firedrill, and Watersmith have all survived, and they’re fascinating to wind through. 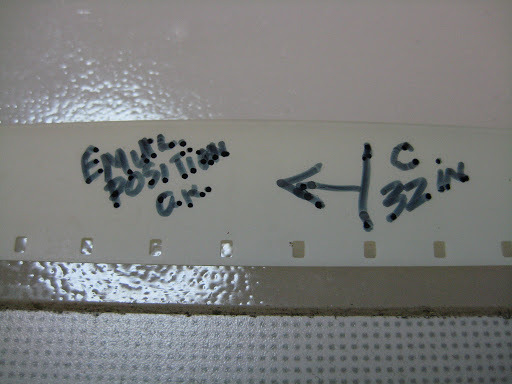 Essentially, they function as a map to the printing of the film. 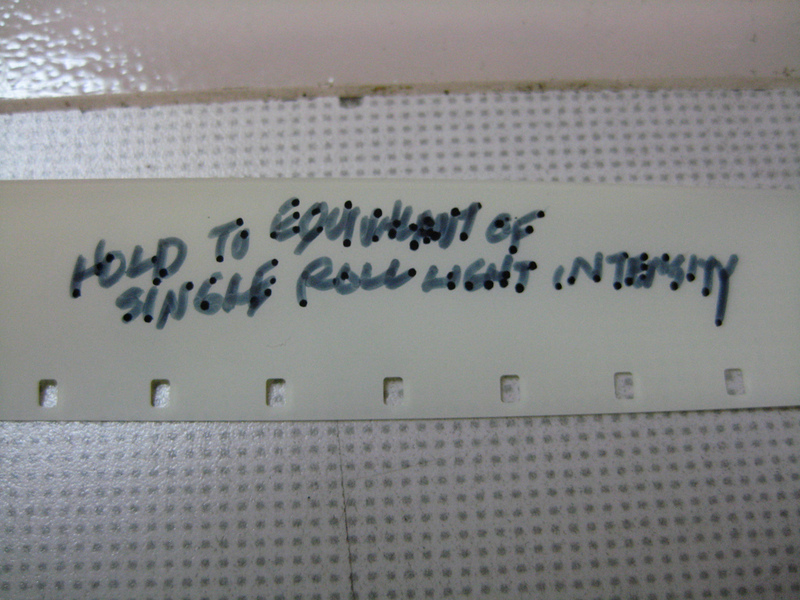 Watersmith was constructed in 16mm reversal A/B/C rolls, meaning there were three full-length printing rolls which, when printed in succession onto the same receiving print stock, employing all the various effects/dissolves/etc Will charted, would create a complete print with all its desired effects, color timing, and so forth. 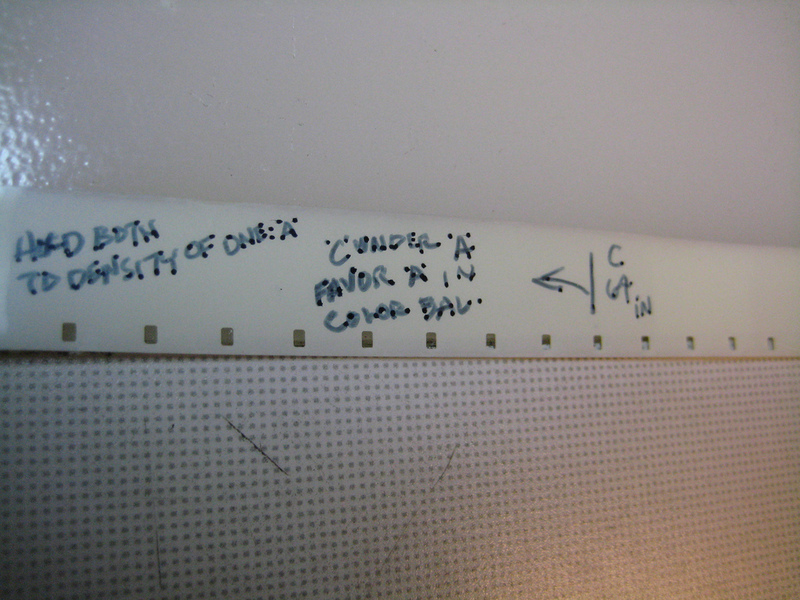 Accompanying these actual printing rolls would be the visual cue roll. See the pictures below to get an idea of what I’m talking about. 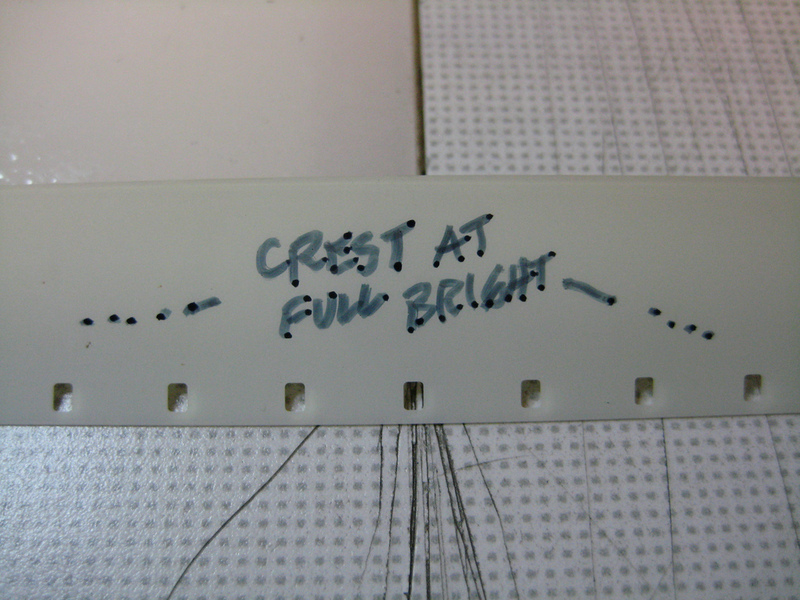 The visual cue roll is a roll of lightstruck leader, the kind of stuff you’d normally splice onto the head or tail of a film, for example. 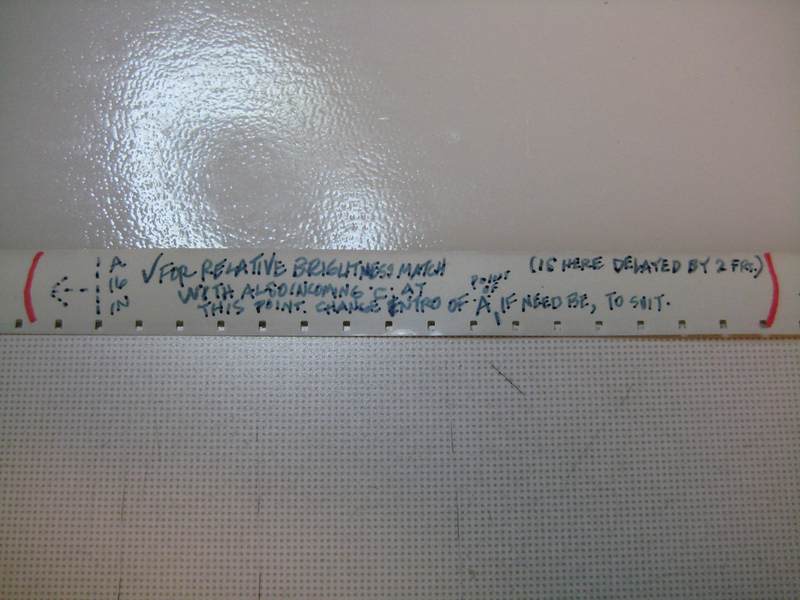 Will created a roll of leader that matched the printing rolls in length, with matching head and tail cue marks as well. 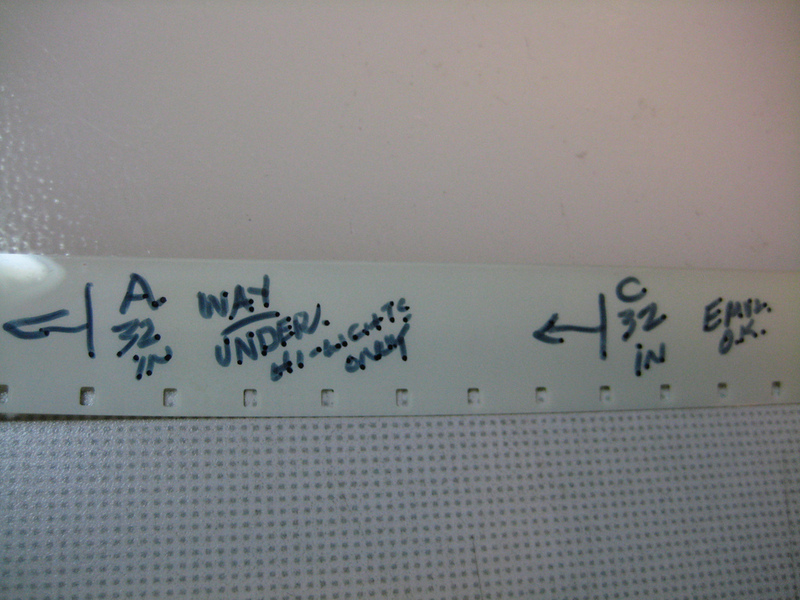 Then, throughout the visual cue roll, he would make notations and labels in magic marker indicating the various effects, color timing requests, and other descriptions of how the A/B/C rolls should be printed by the lab (in this case, Deluxe Hollywood). To me, this is a remarkable primary document, which not only illuminates Will’s process itself, but expresses some of the complexity of his conception for his films as (if I could borrow the expression) sculptures in time. The interaction of layers, the procession of sequences in tandem and succession, are incredibly rich, often moving, highly intuitive yet inexplicable – in other words, Will’s films often have the effect of hitting the viewer on both a gut and intellectual level without you knowing precisely why. I think his control of visual language, in both pure image/sound relationships and in the use of powerful narrative fragments and suggestions, is incredibly unique, and hopefully his work will experience some kind of rediscovery in the near future. I’m currently working on preserving a few of his films, and a few more are short on the heels of these. 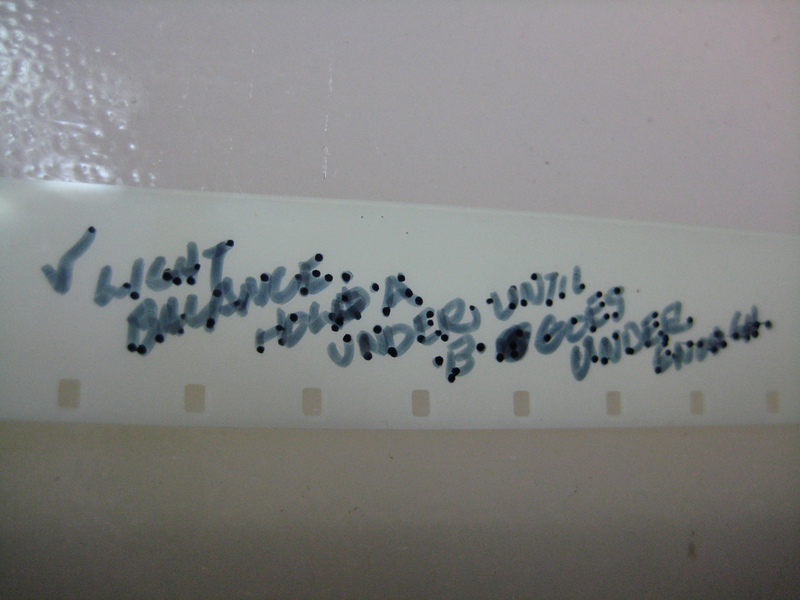 Unfortunately, the one film that perhaps suffers the most, archivally speaking, is Watersmith itself. 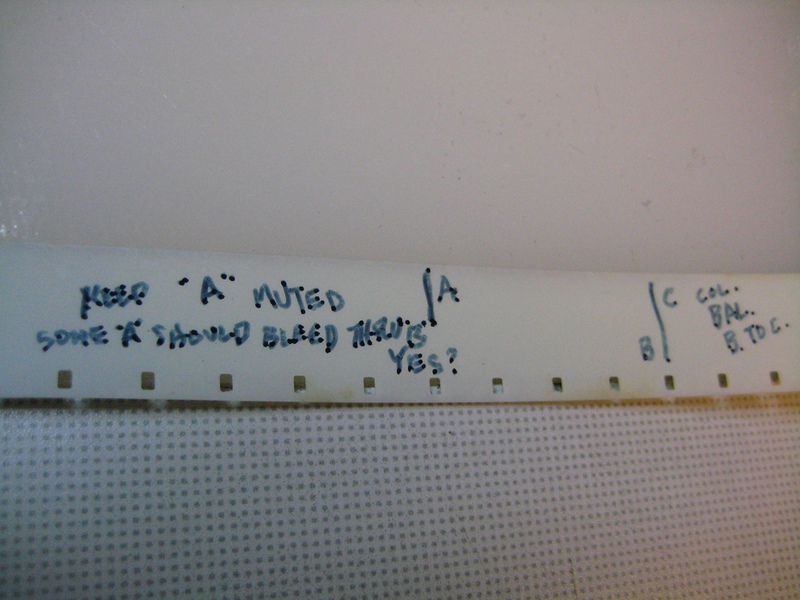 For while the visual cue roll survives in all of its suggestiveness, the original A/B/C rolls are lost. I've been extremely interested in Hindle's films for awhile now but unfortunately have been unable to find much substantial writing on it outside of Youngblood's book and a few scattered articles. Thanks, Jacob. True, Hindle is not very well covered in the histories, except for Gene's book. 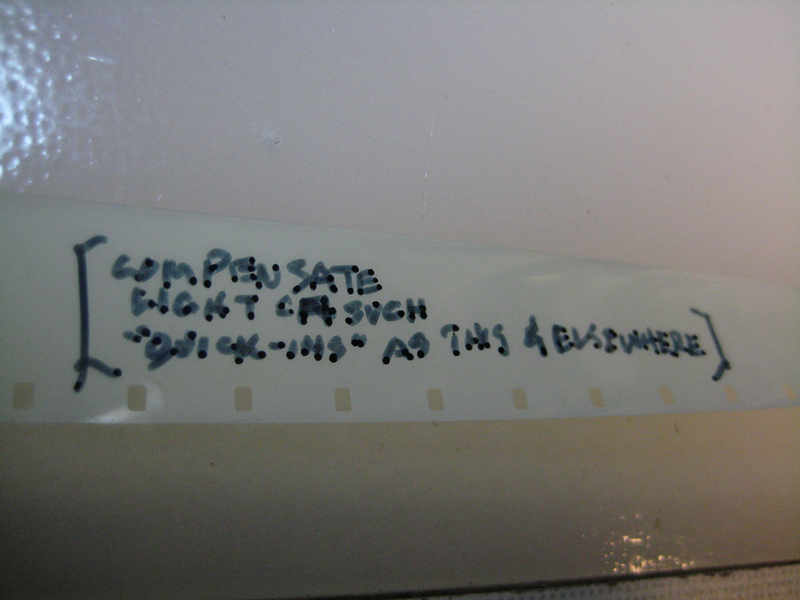 By the way, I should also make it clear – WATERSMITH is not a lost film. Only the originals are lost. 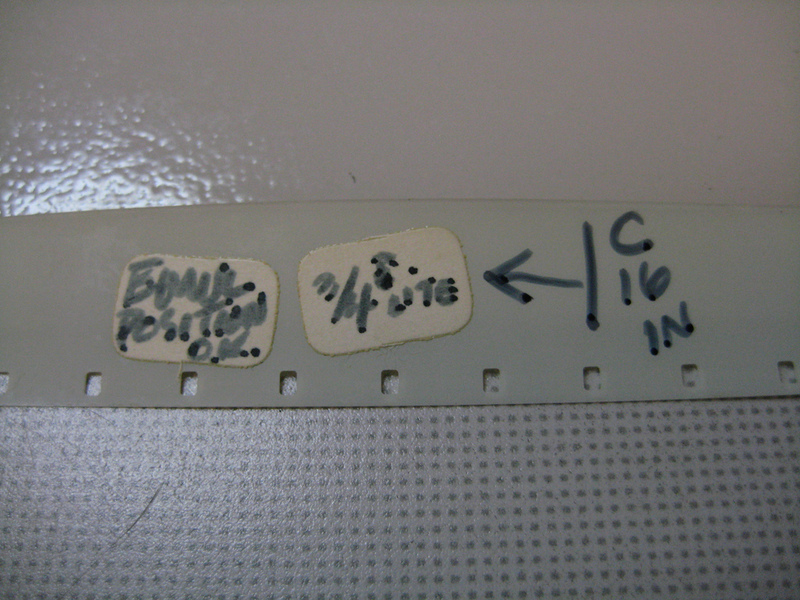 Prints survive, including a couple of fairly good Kodachrome ones, but it's probably the Hindle film which (archivally speaking) survives in the most problematic shape. 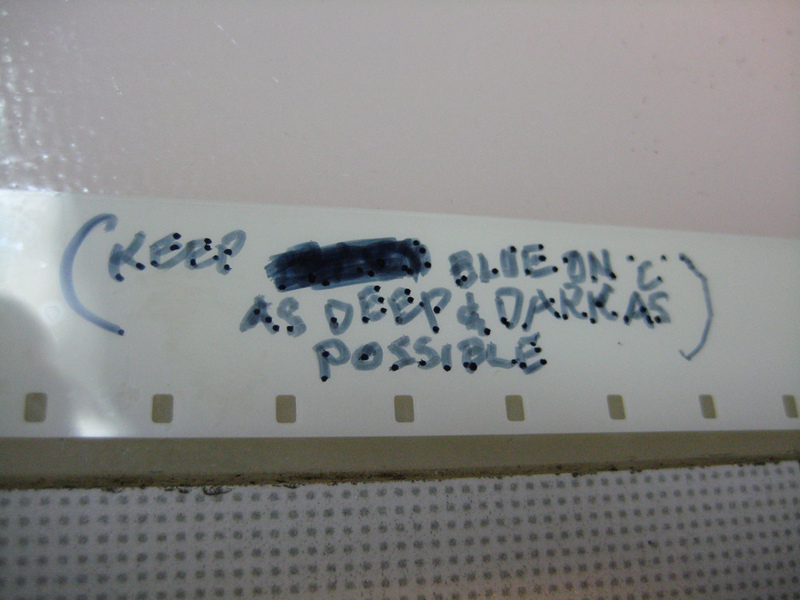 Still optimistic about preserving/restoring it, though. thanks Mark. great post and very illuminating. can't wait to see Watersmith! i also look forward to your longer posts about Will. Would you happen to know how to get a hold of his colleague and friend Charles Lyman? i'd really like to see his documentary about Will, “Journeys in the Kingdom of Shadows”. i tried his email that i found online and his phone number on his production company's website but neither worked apparently. I studied under Will Hindle at the University of South Florida in 1972.It was his first year at USF. His classes were very small with only 8or 9 students – he showed all of his films in class. He was talented and very intelligent. He would allow some of his students to film scenes and often used students in his films. Next Next post: Goodbye, Bob.